The CrazyCrusher brand Rock Crusher is 100 percent steel, and it is 100 percent made in the U.S.A. by 100 percent Americans! The jaws are made of 3/8 steel, and the face has horizontal welds across them that not only help grip and pull down rock pieces, it also prevents wear on the actual jaws. On the moving jaw, vertical "teeth" were added to help dig in and crack the hardest rocks! The adjustable jaw moves from a 1/2 inch opening to all the way closed, for that final grind to get your samples as small as you can for testing. The very bottom of the jaws is what does the "grinding" of the rock into sand sized particles and smaller, some so small it is "air borne". Eventually, like all things, the jaws can wear away, but with this style of adjustable jaw, you can keep moving it in tight for a long time! Although this item was first invented and patented for crushing ore in the field, this handy machine has also been discovered by a different group of users— for the purpose of crushing glass for artwork, also known as "frit glass" which ranges in size from an uncooked grain of rice and finer. The Crazycrusher works perfect for this! The user gets to control the size more accurately due to the crushed glass falling out of the crusher in lieu of being in a pestle and mortar and just re-crushing everything by “pounding sand." Especially for those artisans who work with large quantities of glass, they can do it better and faster with a handy Crazy Crusher! Scroll down the page for lots more information, photos, and to watch an action video! Rock Crusher - FREE SHIPPING! Click here for gas and electric powered rock crushers. Some rocks are harder than others. Most rock structures have a cleavage point, that is, it will break easier if pressure is applied in a given direction as opposed to a different direction. Sometimes it takes a lot of pressure to crack a rock simply by applying pressure on it. The CrazyCrusher brand Rock Crusher is designed to do just that! Some rocks will require several hard jerks down on the handle for the initial breaking. Other rocks respond well by putting your weight behind the handle and arms. By the time you get to the grinding stage, it becomes very easy work. For this reason alone, you will need to either bolt or clamp the CrazyCrusher to a workbench or sturdy table. If taken out into the field, you will either need to clamp it to your tailgate, or perhaps a thick piece of plywood, large enough for someone to fit the legs of a lawn chair on to the front end, and while you work the Crusher, they can have a seat. Another method would be to use a pair of 2x4s about 3 feet long. Bolt the CrazyCrusher to the 2x4s parallel like railroad tracks, and a person can stand on the ends, or even drive your truck tire up on the ends of the 2x4s to keep the crusher from moving around. If the rocks are 1 inch or less, hold the upper far pin with your hand and work the handle with your other hand, but beware, you will be right over the crusher, so be sure that the safety plate is closed! 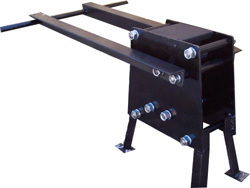 This rock crusher works with a movement of about 10 percent forward against the rock and 90 percent downward, putting pressure on two planes of the rock. Although the CrazyCrusher has an opening of 2 inch by 4 inch, it is very difficult to break some rocks of that size, some even near impossible! As the rock pieces break, they are dragged downward with each up and down motion, causing the pieces to be further broken down as the rock pieces go lower into the "V" of the plates. Some conglomerate rocks and decomposing quartz works well in a larger size, but other rocks, like pure white quartz are more difficult and should be fed in at about a 1 inch size. The jaw plates have random welds across their face to act not only as "fingers" to better grip the rocks, but also to prevent further wear on the jaw surfaces. The lower portion (the grinding area) of the jaw faces have no welds as it would interfere with the grinding process. The first few times you use the CrazyCrusher, you will notice some steel particles in your catch container. This is normal. It would be rare, but it is possible, due to the shape and hardness of some rocks, that the rocks themselves could actually scrape out tiny bits of steel off of the jaws. (Don't forget to put your magnet in a plastic baggy or something so the iron does not stick to the magnet itself!) Using the magnet will also remove any magnetite in your sample, so if you want any iron that is in the sample rock to be analyzed as well, then do not use a magnet. The smaller the rocks, the further down it will go into the jaws, and the easier it is to crush it finer. The upper part of the moving jaw is primarily a forward and back motion, whereas the lower part of the jaw is primarily an up and down motion. NEVER operate the CrazyCrusher with the steel safety plate open! Initial breaking of rocks can and will cause chips to fly out of the top. The safety plate is designed to keep the chips inside the crusher where they belong— not in your eyes! It is highly advisable to wear good leather gloves or mechanics gloves while working this rock crusher to avoid getting blisters. A catch container is included with the rock crusher. Start with the adjustable plate fully open by turning the adjusting screw counter-clockwise, then turn it in a couple turns. Open the safety plate, put your rock(s) in, close the safety plate and press down on the handle harder and harder until it breaks. If it does not break immediately, give it a few "slams" up and down, putting some weight behind it. If you plan on grinding the rock to a fine sand, have the classifying screen handy in a pan or something. Once no more pieces are coming out, dump your catch container into the screen and shake the screen. What does not go through the screen and into your pan can be dumped back in to the crusher after you put your catch container back under the crusher and turn the adjusting screw clockwise to about a 1/4" gap between the lower jaw area when the handles are in the down position. Pour the remaining rock particles back in from your screen into the jaws, close the safety plate and work it again, repeating the process until all the sample passes through your selected screen. To grind a sample, or to grind black sands for further processing, simply close the adjustable jaw until it is resting against the moving jaw. Raise and lower the handle a couple times to assure it is closed all the way and you have full movement of the arms. Starting with the handle in the down position, pour in a few tablespoons of black sands into the CrazyCrusher, and start working the handle up and down until no more sand is coming out. Short choppy strokes work better than full strokes. A grinding operation will create small amounts of ai-borne dust. It is ALWAYS important to either wear a dust mask or be sure to be up wind of the dust. The reason is that you do not know what is in that rock! There could be arsenic and other nasty things in the ore so you don't want to be breathing in that dust! A dust mask is important, especially when using a drywasher! There could be Haunta virus in the sand, mercury— you never know, so please wear a quality dust mask! 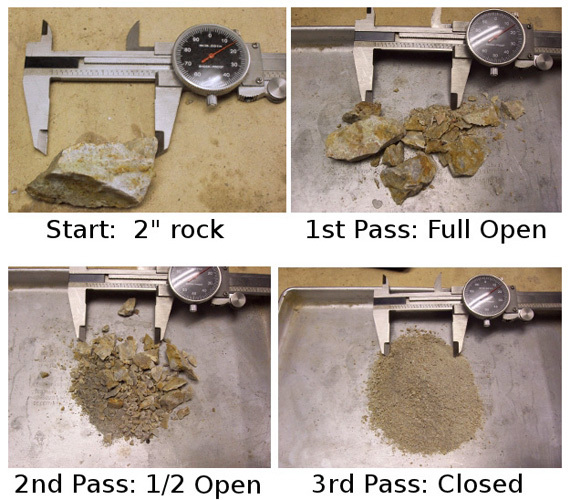 After collecting samples from many places, and when you have time to crush and analyze the ore, you will know without a doubt where you got those samples! It's advisable to get several plastic containers that you can put your crushed ore in, with a larger piece of the ore to identify the rock your material came from. This way you can crush dozens of different samples, store them together and run your tests later down the road. You never know what you will find inside that particular rock, and knowing where you found it is invaluable. If only the miners and prospectors in the olden days had had a GPS— there would not be any "lost mine" stories to read, or to look for! Cleaning out the crusher between samples is easy with a large bottle brush, or compressed air. You can even "hose it out" and then use compressed air to dry it so it does not rust on the jaw faces.